The Andex Charts are tools that help advisors communicate investment trends while setting appropriate risk and return expectations with clients. If you had invested in 1950 in securities included in the DEX Long Bond Index, would you be more or less rich in the early 80s? 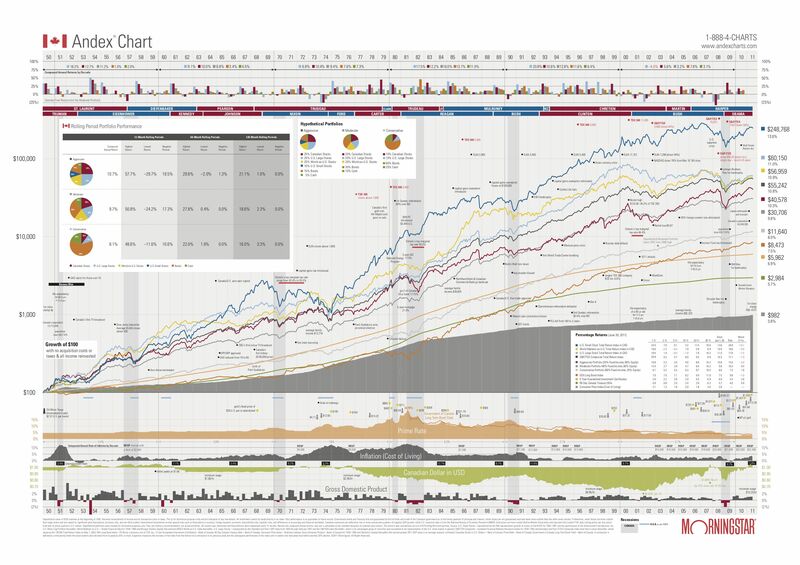 This chart attempts to summarize multiple time series of percentage returns on investments over a long time period, and connect them with historical events (labeled points) and other economic indicators. The main multiple lines graph and the box plots graph may be misleading however. When money is involved in time series, the baseline for returns should be the cost of living since 100$ are not worth the same now than in 1950.